The majority of acute elbow conditions encountered in the emergency setting can be diagnosed on conventional radiographs. The minimal radiographic series includes anteroposterior (AP) and lateral images, while an oblique radial head–capitellar view can help detect subtle fractures by removing osseous overlap of the radial head and coronoid. Examples of all 3 views, with anatomy labeled, are shown in the 3 images below. The radial head–capitellar view may be acquired only when a radial head fracture is suspected, or it may be performed routinely for acute elbow pain or trauma. Normal elbow. 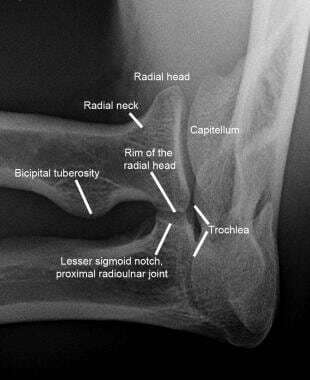 Normal anteroposterior (AP) radiograph of the elbow with labeling of relevant anatomy. Normal elbow. Normal lateral radiograph of the elbow with labeling of relevant anatomy. Normal elbow. 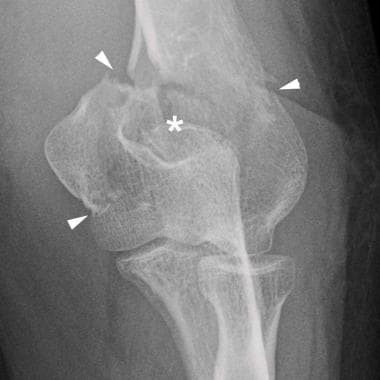 Normal oblique radiograph of the elbow with labeling of relevant anatomy. The technologist may be more adept at performing this view and, therefore, more likely to produce a high-quality radiograph when it is needed, if he or she performs them frequently. Optimal elbow radiographic technique requires the patient to tolerate, and cooperate with, full extension of the elbow for the frontal projection and 90° of flexion for the lateral and oblique views, positions that may be difficult in the acutely traumatized elbow. Splints and other materials included on the radiograph may also adversely affect the image quality. On radiographs, a line drawn along the anterior cortex of the distal humerus, the anterior humeral line, is said to intersect the middle third of the capitellum. 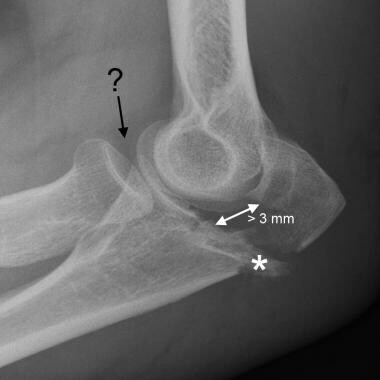 This sign was originally described by Lee Rogers in 1978 in the evaluation of a pediatric elbow for subtle supracondylar fractures,  although reliability has not been reported in adults. Similarly, the radiocapitellar line, drawn along the long axis of the radial neck, should bisect the capitellum on all projections but again its reliability has not been shown in adults. See the image below. Normal elbow. 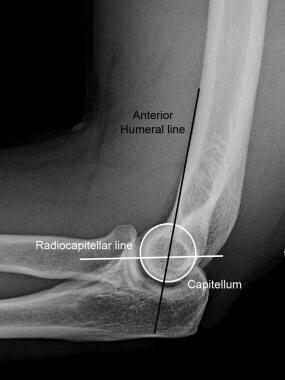 Anterior humeral line and radiocapitellar line on normal lateral radiograph. The anterior humeral line is drawn along the anterior cortex of the distal humeral shaft and should bisect the middle third of the capitellum. The radiocapitellar line is parallel to the long axis of the radial neck and should bisect the capitellum. These were originally reported for evaluation of the pediatric elbow and have not been validated in adults. Elbow, fractures and dislocations. 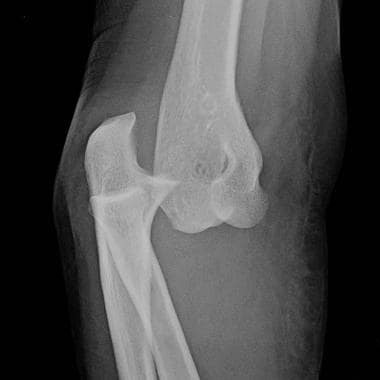 Elbow effusion with associated fat-pad elevation in the setting of radial head fracture. The anterior fat pad is elevated, and its undersurface is convex, giving the "spinnaker sail sign." The posterior fat pad is elevated out of the deep olecranon fossa and is visible just above the cortex of the distal humerus. 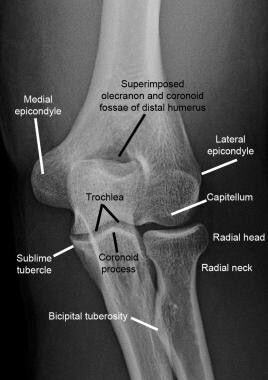 The posterior fat pad normally resides within the much deeper olecranon fossa along the extensor surface of the distal humerus, compressed by the triceps and anconeus muscles during elbow flexion, and it is therefore not seen on a normal lateral elbow radiograph. [7, 9] When elbow effusion elevates the fat pad out of the fossa, it becomes visible posterior to the humerus (see above). Alternatively, the fat pad may be displaced out of the fossa by the olecranon in the otherwise normal, but extended, elbow. 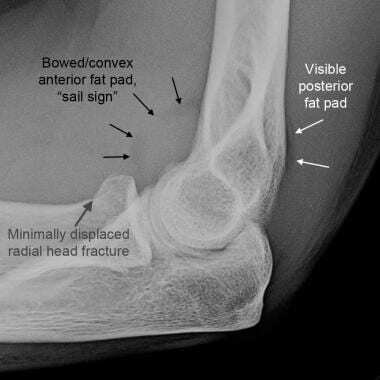 Care should be exercised when interpreting fat-pad elevation on a poorly positioned lateral elbow radiograph. A posttraumatic elbow effusion is most often assumed to be a sign of lipohemarthrosis from acute fracture; however, depending on the clinical setting, effusion could instead be due to hemarthrosis, inflammatory/crystalline arthropathy, or infection. If necessary, advanced imaging or fluid analysis may confirm the diagnosis. The pearls described below helpful for optimizing detection of even subtle injuries. Optimize radiographic technique, especially on the lateral view. Exclusion of anatomy, overlying materials, or elbow extension and/or rotation can all impair one’s ability to detect fat-pad elevation, the most sensitive indicator of intraarticular injuries. Look for fat-pad elevation on every lateral radiograph. An elevated posterior fat pad is never normal, and a fracture or ligamentous injury must be suspected if it is detected. If radiographs are otherwise negative, conservative treatment with follow-up radiographs in 7-10 days is appropriate. Obtain the radial head–capitellar oblique view routinely, but carefully scrutinize this view in patients with tenderness at the radial head. Fractures involving the radial head, capitellum, or coronoid process may only be visible on this view. When a fracture is detected, double-check alignment. Fractures are not infrequently associated with dislocations (eg, Monteggia fracture-dislocation) or instability from ligamentous injuries. These complex injuries are more surgically challenging. Check for fractures after reduction of the elbow dislocation. Missed coronoid process fractures can lead to chronic instability. Image the forearm/wrist if a fracture or dislocation is detected at the elbow. This helps detect any concomitant injuries to the osseous ring of the forearm. For patient education information, see the Breaks, Fractures, and Dislocations Center, as well as Elbow Dislocation and Broken Elbow. Dislocations of the elbow are second in frequency only to dislocations of the shoulder in adults and are the most common dislocations in children. Most elbow dislocations result from falling on an outstretched hand (FOOSH) with extended elbow and are therefore posterior. Anterior, medial, lateral, and divergent types also occur. Dislocations are almost always accompanied by disruption of most or all of the components of the capsuloligamentous complex. 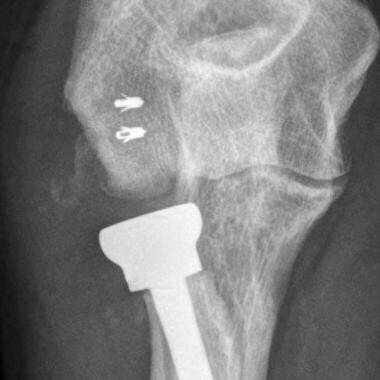 An elbow occasionally dislocates without fracture (simple dislocation), as shown in the image below. Elbow, fractures and dislocations. Posterior dislocation of the elbow without fractures. Note malalignment of the radiocapitellar line and ulnotrochlear joints. Elbow, fractures and dislocations. "Terrible triad of the elbow." 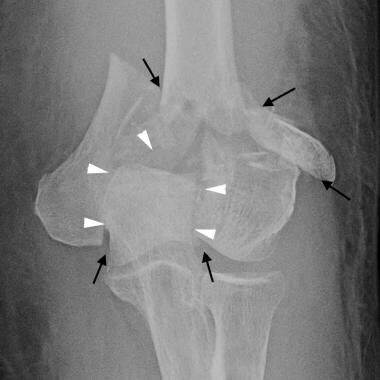 Lateral elbow radiograph shows posterior fat-pad elevation (white arrowhead), widening of ulnotrochlear joint (short white lines), and fractures of the radial head (black arrow) and coronoid process (white arrows). Subtle posterior subluxation of the proximal radius relative to the capitellum also can be seen. 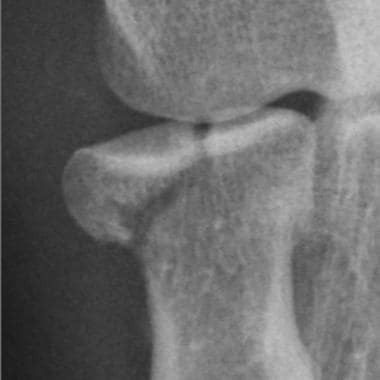 Monteggia fracture-dislocations, as shown in the image below, are another common form of complex fracture-dislocation. These include a combination of proximal ulnar shaft fracture and radial head dislocation (without or with fracture). Elbow, fractures and dislocations. Monteggia fracture-dislocation of the elbow. 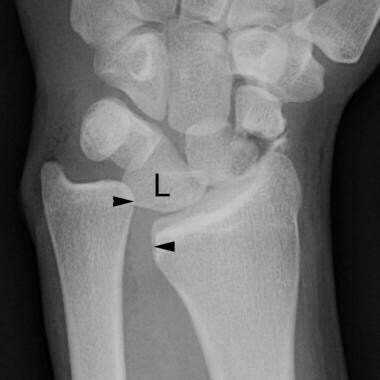 Lateral elbow radiograph shows anterior radial head dislocation (with discontinuity of radiocapitellar line, white line) and an apex-anterior proximal ulnar shaft fracture (black arrow). This would be classified as Bado type I, the most common Bado subtype of Monteggia injuries. They are classified by the Bado classification according to the direction of displacement and location of the ulnar fracture. The Table below summarizes the Bado classification system for Monteggia fracture-dislocations. Additional upper extremity injuries resulting from the FOOSH-type mechanism can be seen at the wrist and shoulder in 10-15% of cases,  and these joints should therefore be imaged in the setting of all elbow fractures and dislocations. The Essex-Lopresti injury is an important, highly unstable variant in which a comminuted radial head fracture (without or with dislocation) is accompanied by tearing of the interosseous membrane and disruption of the distal radioulnar joint, as shown in the images below. Elbow, fractures and dislocations. Essex-Lopresti injury of the forearm. 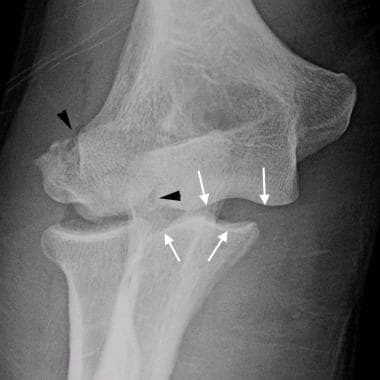 Anteroposterior (AP) elbow radiograph showing fracture of the radial neck (black arrows) and discontinuity of the radiocapitellar line (white lines) due to dislocation of the fractured radial head. Elbow, fractures and dislocations. Anteroposterior (AP) wrist radiograph shows dislocation of the distal radioulnar joint (black arrowheads), and complete disruption of the interosseous ligament is therefore inferred. Incidentally, this patient also has perilunate fracture-dislocation with rotation of the lunate (L) and fracture through the scaphoid waist. Diagnosis of elbow dislocation is usually made easily on radiographs, for which anteroposterior (AP) and lateral views are the most helpful. Associated fractures may be easier to see or localize on postreduction radiographs without splint material. The findings most typical of dislocation include malalignment of the radiocapitellar line and incongruity/widening of the ulnotrochlear joint. Any of the 3 bones involved in the elbow joint can be fractured—the distal humerus, proximal ulna, and proximal radius—with several subcategories of each. Fractures of the distal humerus are not uncommon in elderly osteoporotic patients. In younger adults, these fractures occur in the setting of high-energy trauma. Operative repair is usually preferred and, if possible, is best performed within 24 hours of injury. Fractures of the distal humerus are broadly classified as extraarticular, intraarticular-unicondylar, and intraarticular-bicondylar. The supracondylar humerus is frequently fractured in children, but this is covered separately in Imaging in Pediatric Elbow Trauma. In contrast, extraarticular distal humeral fractures are unusual in adults. They can result from hyperextension (FOOSH), hyperflexion (direct impact to flexed elbow), or adduction or abduction mechanisms. Most traverse the supracondylar segment of the distal humerus that is thinned by the radial, coronoid, and olecranon fossae. As this portion is intracapsular (though extraarticular), a joint effusion is common, and displaced free intraarticular fragments can be detected. Some fractures are even more distal, extending across the condyles proximal to the articular surface, which complicates placement of surgical hardware. A traction view, as shown below, is helpful to exclude subtle transcondylar extension in adults. Displaced fractures should be referred to an orthopedist. Elbow, fractures and dislocations. Comminuted extraarticular fracture of the distal humerus (white arrowheads), intersecting within the distal humeral fossae (*). This traction view was performed to exclude subtle intraarticular extension. These are oblique fractures that extend from the medial or lateral humeral shaft cortex across the distal articular surface, usually through the trochlear sulcus or the trochlear groove. This isolates either the trochlea or capitellum from the distal humerus. The other humeral condyle, though, remains attached to the shaft. When the trochlea remains attached to the humerus and ulnotrochlear joint alignment is maintained, the capsuloligamentous complex is often intact and conservative treatment can be considered. Displacement of the radius and ulna with the fractured condyle, however, represents a fracture-dislocation of the elbow and requires surgical fixation because it is unstable. See the image below. Elbow, fractures and dislocations. Unstable unicondylar distal humeral fracture. 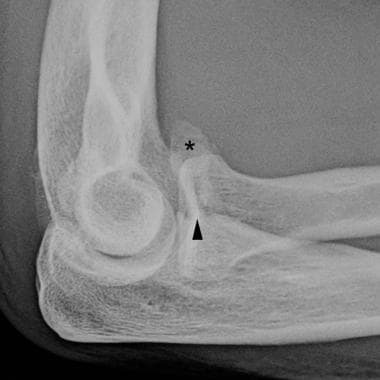 Anteroposterior (AP) elbow radiograph shows comminuted fracture of the capitellum (black arrowheads). Disruption of the ulnotrochlear joint alignment (white arrows) indicates concomitant ligamentous injury that necessitates surgical repair. The injury is also open in this case. These are comminuted, often T-, Y-, or H-shaped, fractures of the distal humerus that result in separation of both the medial and lateral humeral condyles from each other and from the shaft. These fractures nearly always require surgery. The difficulty of repair depends on the complexity of fractures through the articular surface and through the metaphyseal cortices, as well as the vertical height of the metaphyseal fracture above the articular surface. Fractures that are more distal have a smaller zone for surgical plate placement. Free fragments of the trochlea (as shown below) are at risk for avascular necrosis. The fractures usually intersect in the humeral fossae and are comminuted, resulting in small free intraarticular loose bodies. CT scanning may be helpful for preoperative planning. Elbow, fractures and dislocations. Comminuted bicondylar distal humeral fracture. Anteroposterior (AP) elbow radiograph shows fracture lines extending through the medial and lateral cortices of the distal humeral shaft, between the trochlea and capitellum, and between the trochlea and medial epicondyle (black arrows). Marked comminution is noted at the distal humeral fossae. The presence of the free trochlear fragment (outlined with white arrowheads) both increases difficulty of operative repair and increases risk of avascular necrosis. 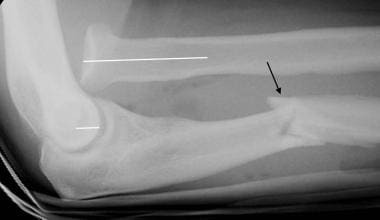 Fractures of the proximal ulna can involve the olecranon, coronoid process, or proximal ulnar shaft, such as in Monteggia fracture-dislocation. 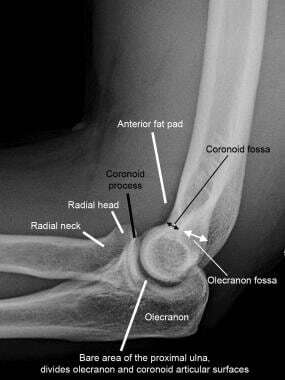 Fractures of the olecranon are not uncommon, representing 10% of all fractures in the upper extremity. Nondisplaced and minimally displaced fractures can be treated conservatively. If, however, displacement exceeds 3 mm or increases with elbow flexion, surgical repair is considered and becomes increasing complex with the addition of comminution of the olecranon or collateral ligament instability,  as shown in the image below. These fractures are encountered with greater frequency in osteoporotic elderly patients and are often the result of fall directly onto the elbow. The fracture and joint capsule may be open. Elbow, fractures and dislocations. Olecranon fracture. 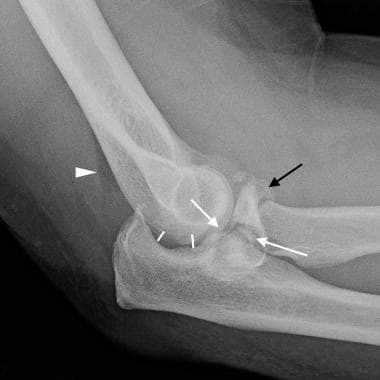 Lateral elbow radiograph demonstrates comminuted (*) fracture of the olecranon with more than 3 mm of distraction of the proximal fracture fragment (double-ended white arrow) by the triceps tendon. This usually requires surgical repair. The radiocapitellar joint appears widened (black arrow), raising concern for concomitant ligamentous injury, which could be confirmed intraoperatively. Less than 1-2% of elbow fractures involve the coronoid process, and, when present, these injuries are rarely isolated, more often associated with elbow dislocation, radial head fracture, or both (the terrible triad). The coronoid process is essential for elbow stability. It acts as a bony constraint against posterior elbow dislocation. It also serves as the attachment site for the anterior joint capsule and fibers of the medial and lateral collateral ligaments and brachialis. Fractures involving more than 50% of the coronoid are particularly unstable. See the images below. Elbow, fractures and dislocations. Coronoid process fracture. 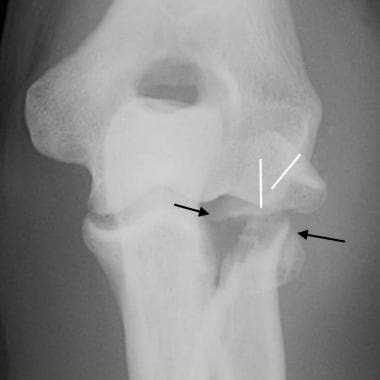 Lateral elbow radiograph demonstrates a displaced fracture fragment (*) arising from the coronoid process (black arrowhead). Elbow, fractures and dislocations. Coronoid process fracture. 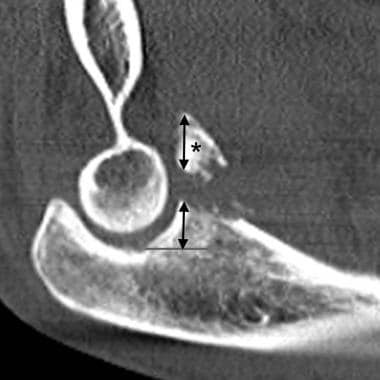 Sagittal CT image indicates that the coronoid fracture fragment (*) involves more than 50% of the coronoid height (double-ended arrows), increasing the risk of elbow instability if not repaired. Radial head fractures are the most common fracture in the adult elbow, accounting for 30-56% of fractures. [8, 18] Most result from a FOOSH-type injury, but high-energy trauma can cause complex radial head fractures, often in combination with other elbow and upper extremity injuries (see Essex-Lopresti and Monteggia injuries above). Nondisplaced and minimally displaced fractures can be treated conservatively with a sling and radiographic follow-up. Since posttraumatic elbow effusion is most often due to a nondisplaced radial head fracture, these are treated the same way. Several classification systems exist but none is comprehensive or highly reliable. These are not be discussed in detail, but the overriding principles are that nondisplaced or minimally displaced fractures are treated conservatively, while displaced fractures, comminuted fractures, fractures with block to passive range of motion, or those accompanied by other fractures and/or dislocation/instability require orthopedic referral for possible surgery. An important consideration is the extent of involvement of the rim of the radial head, which articulates with the lesser sigmoid notch of the proximal ulna and enables the normal 180° range of motion of the forearm for supination and pronation. Fractures involving only a small portion of the lateral radial head margin, a third or less, likely spare the articulation and should not impair forearm motion. Conversely, more extensive radial head and rim involvement, particularly if displaced and/or comminuted, is likely to impair forearm mobility. Surgery may entail fixation of the radial head/neck, radial head excision, or arthroplasty and depends on the severity of the fractures and integrity of the soft-tissue stabilizers of the elbow. Elbow, fractures and dislocations. Radial head fracture. Anteroposterior (AP) elbow radiograph shows a minimally displaced fracture of the lateral radial head, involving slightly more than half of the articular surface and radial head rim. Elbow, fractures and dislocations. Radial head fracture. Postoperative radiograph shows this injury was treated with radial head replacement. CT scanning is helpful in select patients for further characterization of fractures and alignment prior to surgery and can be performed following reduction and splinting. If thin-section multidetector row CT (MDCT) is complemented with multiplanar reconstructions, the degree of confidence in the findings is high. See the image below. Elbow fractures and dislocations. 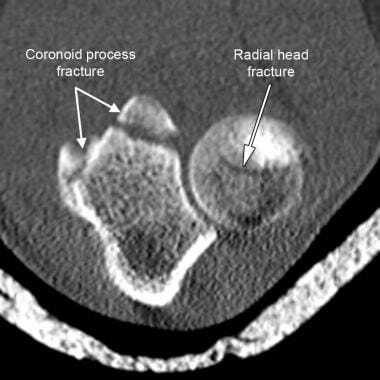 Axial CT image was obtained post reduction and splinting for surgical planning purposes and shows acute fractures of the radial head and coronoid process. Upper extremity CT angiography may be useful if there are signs of brachial artery injury related to displaced fractures or dislocations of the elbow. CT findings may include transection, thrombosis, dissection, and intimal flaps. Conventional angiography can also show these findings but is invasive. MRI is used widely in the setting of chronic elbow pain but has limited use in the setting of acute elbow trauma. It is generally used as a problem-solving tool in patients with continuing pain despite conservative management. In that case, it is invaluable in the assessment of collateral ligaments, common flexor and extensor tendon origins, articular cartilage, and occult bone lesions. MR arthrography may be used for evaluation of osteochondral lesions and their stability. MRI can also be used acutely for diagnosis and presurgical planning of bicipital and tricipital tendon ruptures, although ultrasonography can also be used for this purpose. See the image below. Elbow fractures and dislocations. 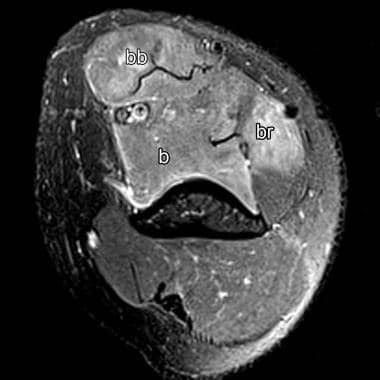 Axial fat-suppressed T2 MRI through the distal humerus shows abnormal high T2 signal within the biceps brachii (bb), brachialis (b), and brachioradialis (br) muscle bodies, compatible with strain. Clinically, this mimicked biceps tendon rupture, but the tendon was found to be intact. MRI has been used to identify the location and severity of ligamentous injuries after acute elbow dislocations. In one study, complete ligamentous tears were found to be more common on the medial side than on the lateral side. MRI can also be used to assess the interosseous ligament when subtle Essex-Lopresti dissociation is suspected. Ultrasound can be used acutely for diagnosis and preoperative localization of ruptured biceps and triceps tendons. In such cases, comparison to the normal contralateral side may be helpful. However, ultrasound examination depends on operator experience and skill to perform and interpret. Definite signs of arterial injury (eg, pulsatile hemorrhage, absent distal pulses, overt distal ischemia, audible bruit, and a palpable thrill) typically prompt immediate surgical exploration; however, in select cases, conventional angiography may be considered for assessment and treatment of the brachial artery at the elbow. Transection, thrombosis, dissection, and intimal flaps may be found. Upper extremity CT angiography is favored for diagnosis because it is noninvasive; however, it does not allow concomitant endovascular therapy. Darracq MA, Vinson DR, Panacek EA. Preservation of active range of motion after acute elbow trauma predicts absence of elbow fracture. Am J Emerg Med. 2008 Sep. 26(7):779-82. [Medline]. Lennon RI, Riyat MS, Hilliam R, Anathkrishnan G, Alderson G. Can a normal range of elbow movement predict a normal elbow x ray?. Emerg Med J. 2007 Feb. 24(2):86-8. [Medline]. [Full Text]. Arundel D, Williams P, Townend W. Deriving the East Riding Elbow Rule (ER2): a maximally sensitive decision tool for elbow injury. Emerg Med J. 2013 Feb 8. [Medline]. Goldflam K. Evaluation and Treatment of the Elbow and Forearm Injuries in the Emergency Department. Emerg Med Clin North Am. 2015 May. 33(2):409-421. [Medline]. Norell HG. Roentgenologic visualization of the extracapsular fat; its importance in the diagnosis of traumatic injuries to the elbow. Acta radiol. 1954 Sep. 42(3):205-10. [Medline]. Rosas HG, Lee KS. Imaging acute trauma of the elbow. Semin Musculoskelet Radiol. 2010 Sep. 14(4):394-411. [Medline]. Murphy WA, Siegel MJ. Elbow fat pads with new signs and extended differential diagnosis. Radiology. 1977 Sep. 124(3):659-65. [Medline]. Fitzpatrick MJ, Diltz M, McGarry MH, Lee TQ. A new fracture model for "terrible triad" injuries of the elbow: influence of forearm rotation on injury patterns. J Orthop Trauma. 2012 Oct. 26(10):591-6. [Medline]. Hildebrand KA, Patterson SD, King GJ. Acute elbow dislocations: simple and complex. Orthop Clin North Am. 1999 Jan. 30(1):63-79. [Medline]. Kundel K, Braun W, Wieberneit J, Rüter A. Intraarticular distal humerus fractures. Factors affecting functional outcome. Clin Orthop Relat Res. 1996 Nov. 200-8. [Medline]. Morrey BF. Current concepts in the treatment of fractures of the radial head, the olecranon, and the coronoid. Instr Course Lect. 1995. 44:175-85. [Medline]. Ring D. Fractures of the coronoid process of the ulna. J Hand Surg Am. 2006 Dec. 31(10):1679-89. [Medline]. Mason ML. Some observations on fractures of the head of the radius with a review of one hundred cases. Br J Surg. 1954 Sep. 42(172):123-32. [Medline]. Pike JM, Athwal GS, Faber KJ, King GJ. Radial head fractures--an update. J Hand Surg Am. 2009 Mar. 34(3):557-65. [Medline]. Smith GR, Hotchkiss RN. Radial head and neck fractures: anatomic guidelines for proper placement of internal fixation. J Shoulder Elbow Surg. 1996 Mar-Apr. 5(2 Pt 1):113-7. [Medline]. Sormaala MJ, Sormaala A, Mattila VM, Koskinen SK. MDCT findings after elbow dislocation: a retrospective study of 140 patients. Skeletal Radiol. 2014 Apr. 43(4):507-12. [Medline].